In any state, local governments, along with certain companies, environmental groups, and other stakeholders, often share policy priorities and are invested in shaping statewide and local product stewardship initiatives, both legislative and voluntary. However, it can be a challenge for these different groups to come together and promote one cohesive message. 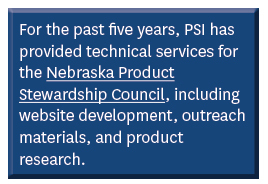 PSI supports and aids local government groups and their allies in advancing product stewardship through a range of helpful services. PSI provides organizational coordination (i.e., establishing product stewardship councils), meeting facilitation, technical assistance, website development and social media support, cooperative financing opportunities, fiscal services, and access to information and networks. Ultimately, PSI empowers these groups to implement their own extended producer responsibility (EPR) laws and programs independently. PSI offers trainings, information, and strategic advice to develop EPR implementation skills. PSI facilitates conversations between stakeholders to create programs and develop solutions that address the need for convenient, safe disposal of various products. To allow for an exchange of perspectives, PSI initiates, coordinates, and facilitates dialogues between key industry, government, and non-profit groups to reach multi-stakeholder consensus on priority initiatives. • regulatory issues related to the collection, transport, and disposal of waste products. PSI helps stakeholders develop the skills necessary to lead their own group initiatives and develop/implement their own programs. PSI advises PSCs on group structure, provides organizational support and expert guidance on product approach and work plan development, and trains organization leaders to facilitate effective group meetings. PSI also provides fiscal services, devises fundraising strategies, and guides the grant-writing and fundraising process. Provides technical assistance and support. PSI offers local governments, coalitions, and councils with product-specific support, including expert technical, financial, and political analyses on any given product category. We also conduct product-specific research and surveys. 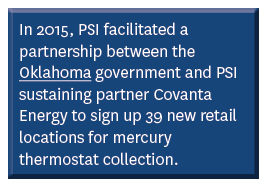 PSI monitors, informs and advocates for product stewardship legislation on behalf of all local government coalitions. We assist in the development and passage of legislation and the creation of educational materials to promote bill passage, while offering expert testimony. We provide exclusive resources for PSI Members and Partners – login or learn more. PSI develops and hostsinformative webinars, meetings, conferences, and PowerPoint presentations on various products on behalf of of local governments. To provide educational outreach and communications support, we develop fact sheets, posters, brochures, press releases, blog posts, FAQs, toolkits, model legislation, and other marketing collateral on an ongoing basis. PSI offers customized research and strategic consulting services. We work with the client to develop a scope of work, and implement a project that exceeds expectations. To view existing laws in the U.S., visit our State EPR Laws Map . To view pending and active legislation in the U.S.—privileged content available exclusively to PSI Members and Partners—login here. Contact Amanda Nicholson at (617) 236-4833 to learn more about these local product stewardship initiatives and PSI's outreach, coordination, and facilitation services for product stewardship councils and coalitions.